In New Jersey, an employee who is laid off or fired can be eligible for unemployment insurance benefits in New Jersey if he earned enough money during the relevant period. In addition, an employee who was forced to resign also may be eligible for unemployment benefits if he resigned for “good cause” relating to his job. Good cause can exist, for example, if an employee quit because his working conditions were unhealthy or dangerous or because he experienced unlawful discrimination or harassment at work. What Disqualifies an Employee for Unemployment Benefits? An employee can be disqualified from receiving unemployment benefits if he or she was fired for misconduct. Misconduct occurs when the employee intentionally violated the company’s rules or policies, or another duty to the employer. The employer has the burden to prove it fired the employee because he or she engaged in misconduct. The length of a disqualification for misconduct depends on the severity of the misconduct. An employee who is found to have engaged in “simple misconduct” is not entitled to receive benefits for the first eight weeks. However, this waiting period does not reduce the total amount of benefits the employee can receive; it just delays when the benefits begin. In contrast, an employee who is fired for “severe misconduct” or “gross misconduct” is ineligible to receive any unemployment benefits until he or she has been reemployed and has worked for a specific period of time. The exact lines between simple, severe and gross misconduct are far from clear. As a result, it is extremely important that the New Jersey Department of Labor ("DOL") accurately understands the facts leading to you termination. Accordingly, it can be critical to have a New Jersey unemployment insurance benefits lawyer help you prepare for your unemployment hearing. If you need help with your unemployment benefits hearing, please feel free to call us at (973) 744-4000. 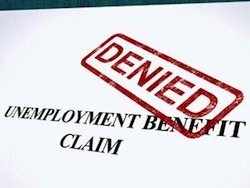 What Should I Do If My Initial Claim for Unemployment Benefits is Denied? If your initial unemployment benefits claim is denied, you have a short time to appeal the decision to the Appeal Tribunal. It is important to be well prepared for the appeal hearing, which normally takes place over the telephone. Rabner Baumgart Ben-Asher & Nirenberg, P.C. represents employees who are appealing a determination of ineligibility, as well as those who defend their right to benefits when the employer appeals. We can either represent you during your hearing or help you prepare to represent yourself. Our New Jersey unemployment insurance attorneys also can help you request a copy of any documents your employer submitted to the DOL. What Are My Options If My Appeal is Denied? If the Appeal Tribunal denies your appeal, you have the right to appeal that decision to the Department of Labor Board of Review. Appeals to the Board of Review are normally decided based on written submissions from the parties. Therefore, it generally is preferable to have an employment lawyer represent you on this appeal. The Board of Review’s decision is the final administrative decision, which can be appealed to the New Jersey Superior Court’s Appellate Division. If the New Jersey Department of Labor has denied your unemployment benefits claim or otherwise found you are ineligible to receive unemployment benefits, you can contact us online or call us at (973) 744-4000 to schedule a consultation with one of our New Jersey unemployment insurance benefits lawyers.